Jacob Bent, 17, and Victoria Holbrook, 17, both of Amesbury, Massachusetts, were riding on the lake with Jeffrey Holbrook, 53. 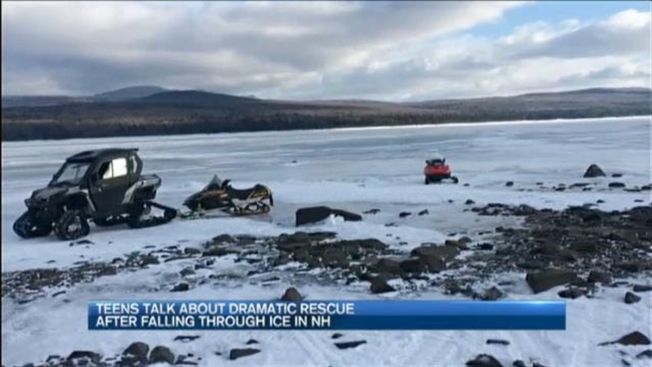 Officials with New Hampshire Fish and Game rescued two teenagers whose snowmobiles became submerged after breaking through ice on First Connecticut Lake. A Massachusetts family is coming home from vacation with an incredible survival story. Jacob Bent and Victoria Holbrook, both 17 and of Amesbury, were snowmobiling in Pittsburg when they fell through some weak ice and had to be rescued. "The snowmobile started stalling and began sinking and I looked over and Jacob was sinking too," said Holbrook. Holbrook was snowmobiling with Bent and her dad. The two teens fell into three and a half feet of frigid water while crossing First Connecticut Lake Wednesday. "I am just so happy it wasn't as bad as it could've been," Holbrook said Thursday. Holbrook's dad, Jeff, was leading the way. He made it across without falling in and then rushed to get help. "I tried to make sure they stayed calm and didn't panic, I didn't want them getting wet," he said. The teens stayed on top of their snowmobiles which were being held up by a second, stronger layer of ice. "I feel very fortunate," Victoria Holbrook said. " It's scary to think if there wasn't a layer underneath us it would have been really bad." Experts say inconsistencies in the color of ice is an indication of weakness. Solid ice is usually darker and rather clear. Weak ice is slushy, white and cloudy. "This has not been a typical winter, water bodies are not going to be what the have been in past years, so you've got to use common sense," said New Hampshire Fish and Game Captain Jim Juneau. "We would never consider any water body safe this time of year." Juneau says if there wasn't that second layer of ice in Pittsburg to catch Holbrook and Bent, the circumstances could've been deadly. "Hypothermia is a real concern," he said. "It can take merely minutes." Holbrook and her dad say the "what-ifs" are the scariest part of this story. "If it was at nighttime and the water was deeper, a lot of things could have happened," Jeff Holbrook said. "It's dangerous, you don't know what's out in the middle until you're there," Victoria Holbrook said. "Just be careful." Jeff Holbrook says Victoria grew up riding snowmobiles and now has her license to drive one. Nobody was hurt on Wednesday. They continued riding Thursday and are heading back to Amesbury on Friday.